Week 2 was another busy one in Olympia: over 1,000 new bills have been added to the hundreds still alive from 2017 and committee and floor votes are happening quickly. This year is a short session, which means that we are already halfway to the first calendar cutoff where a bill must pass out of committee to remain alive. The week started off fast with public hearings on several highly publicized issues—trigger modification devices on firearms, the Attorney General’s plan to address the opioid crisis and voting rights. Tuesday’s hearing on SB 6203—the governor’s carbon tax bill which would place a $20/ton tax on carbon emissions—garnered substantial attention from stakeholders on both sides. Other big ticket items in committee this week included legislation to protect consumers’ personal and financial data, reduce food waste and ensure statewide net neutrality. Notably, gender pay equity legislation passed on the House floor 69-28 and will now move to the Senate for a vote. AIA Washington Council has worked with Rep. Tana Senn (D-Mercer Island) on legislation to provide adequate funding to the State Building Code Council (SBCC) to allow it to accomplish its mandated work. Reforms to the way the SBCC operates were included in the most recent version of the bill at the request of building industry stakeholders. AIA has agreed to accept an added $6.50 fee for new and renewed architecture licenses (due every 2 years) to help raise additional funding for the SBCC. We expect this bill to pass this year as it had the support to pass last year but was held up by Republican leadership in the Senate. Secure funding for the state’s Housing Trust Fund – this priority was accomplished with the passage of the capital budget, which contains $106 million for the Housing Trust Fund to make investments in housing for vulnerable citizens. This will also allow the state to leverage other public and non-profit dollars for housing. Increase the cap on the Real Estate Excise Tax – AIA supports legislation to allow cities to enact up to a 0.25% additional Real Estate Excise Tax (REET) to provide local governments with the option of creating a new dedicated revenue source specifically for affordable housing. Pass the preservation tax exemption – AIA supports legislation to allow local governments to exempt property tax on multi-family units that are designated for affordable housing for very low-income households. AIA Washington Council is still digesting Sen. Pedersen’s 134-page bill, which looks to be a total rewrite of the Washington Condominium Act. Rep. Senn’s bill addresses a smaller piece of the problem by restricting the board of directors of a condo association from participating in litigation against builders without approval from a majority of HOA members. Rep. Ryu’s bill clarifies issues contained within the existing Construction Defects Statute and increases the length of time the statute of limitations can be tolled from 60 days to 105 days. “Tolling” means the clock stops on the time period for the statute of limitations. The bill would also allow tolling of the statute of repose, which cuts off certain legal rights if they are not acted on by a specified deadline. AIA does not support the tolling provisions. As part of our discussions on this issue, AIA will advocate for added protections for design professionals from the risk created when the LLC that developed the project is dissolved. Dissolution of the LLC leaves damaged consumers unable to pursue the developer of the project and isolates design professionals as the likely targets for lawsuits. AIA’s climate change policy goals are prioritized by the areas where architects can make the most difference and those that will result in the biggest impact to climate change. AIA supports carbon pricing or carbon tax proposals in principle and has advocated for a large portion of the revenue produced in any pricing scheme to be reinvested in building energy improvements and other projects that will further help to reduce carbon emissions. 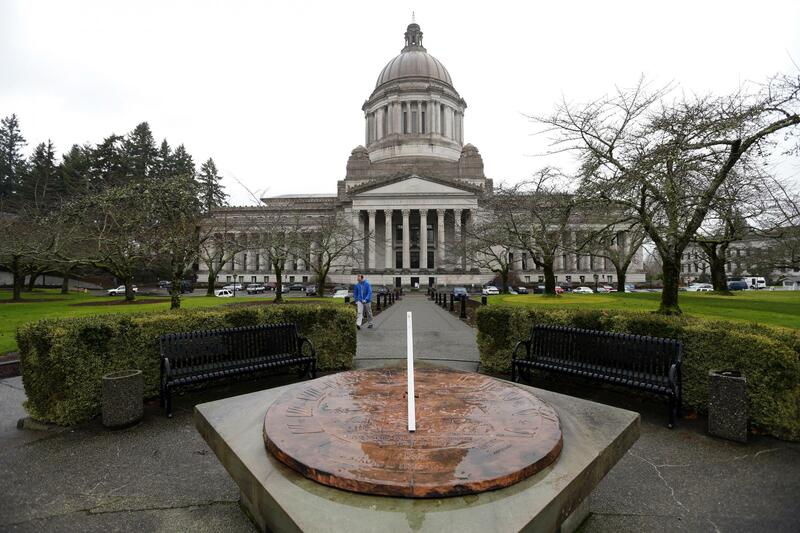 Governor Inslee has released a carbon tax proposal sponsored in the Legislature by Sen. Reuven Carlyle (D-Seattle). While there is a lot of interest in this bill, it will be a heavy lift even for Democrats to pass a new taxation scheme during a short session and an election year. AIA officially commented twice on the governor’s proposal, once in testimony by Kirsten Smith, manager of advocacy, and once in a letter to Sen. Carlyle with suggested changes to the section on the design and construction of new and retrofitted highly energy efficient buildings. AIA also supports other efforts to incentivize high-performance buildings, as energy efficient design is much more cost-effective than building new power sources for Washington’s growing population. Methods to achieve this could include creating consistent, progressive energy codes and exploring the use of performance-based code. A separate bill, by Rep. Beth Doglio (D-Olympia), is the first bill to address embodied carbon in building materials in Washington. It would establish a maximum acceptable global warming potential for specified materials used in certain public building projects. This bill may also be too complicated to pass in one session, but architects are among the stakeholders working with the author to improve it. Legislation to allow some form of public private partnerships for alternative public works contracting has been introduced in the Legislature for the first time. Rep. Vincent Buys (R-Whatcom County) and Rep. Gael Tarleton (D-Seattle) are the sponsors of HB 2726. The bill is too new for AIA Washington Council to have developed a position, but we have general comments and concerns about P3s and how they will impact architects. The issue is very technical, very complicated, and impacts different-sized architecture firms differently. Because of the complexity involved, we do not expect this legislation to pass this year. AIA will engage in the conversation, identify our questions and concerns, and remain part of the debate as it continues in future years. If you would like to be part of the discussion related to AIA’s position on P3s, please let AIA Washington Council staff know. The AIA Washington Council is working with allies to amend Washington’s state building code to permit the use of mass timber construction in tall buildings. The amendment we will be seeking will be based on the studies and proposed code language prepared by the ICC Ad Hoc Committee on Tall Wood Buildings. These vetted ICC code sections were released this past week. This is not a legislative action; the amendment will be offered through the standard code amendment process of the State Building Code Council. In addition, AIA Seattle will be participating in efforts to utilize the new ICC code sections in Seattle code. We welcome your feedback! If you have questions or comments on any of these issues, or any others, please contact Kirsten Smith, manager of advocacy, at kirstens@aiaseattle.org or 206-488-4938 x401.